RAI #0 CGC 9.8 WP Valiant Comics 11/92 "Matte" version 1st full app Bloodshot! Rai #0 (1ST FULL RAI/BLOODSHOT) & Bloodshot #1 KEY 1992/1993 Valiant Comics LOT! Rai #2 HTF Pre Unity Issue! Versus Icespike! Rai #0 matte and Bloodshot #0 gold edition package! 2 product ratings - Rai #0 matte and Bloodshot #0 gold edition package! 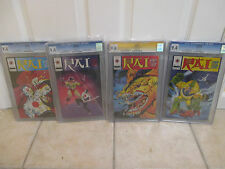 RAI #0 (1992) VALIANT COMICS 1ST APPEARANCE BLOODSHOT! 1ST PRINT! LAPHAM ART! Rai #0 - Valiant Comics (1st Full Appearance Bloodshot) Very High Grade!